During the first few years of the association, as well as cave rescues, the team rescued sheep and other stock from mineshafts. Members carried out long and difficult searches for people missing on the fells above Wharfedale. They were involved in a number of rescues in Dow Cave-Providence pot, and recovering a fatality from Hell Hole above Trollers Gill. The last two years of the 1950s saw a number of demanding cave rescues in the Yorkshire Dales, particularly in the Dow Cave Providence Pot system. These rescues required large reserves of manpower, pushing the CRO and UWFRA close to their limits. As a result, the CRO decided to establish local cave rescue teams sourced from the areas where the major caving clubs were based i.e. Leeds and Bradford and some of the small towns in Lancashire. 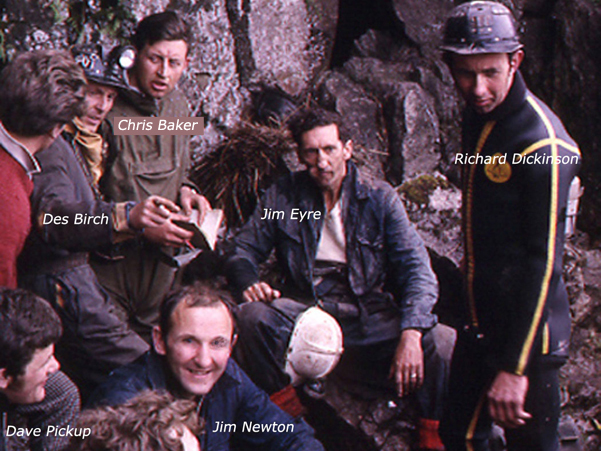 In 1962 the Bradford CRO team which was affiliated to the Cave Rescue Organisation based in Settle was formed, and UWFRA was not slow in offering their advice and expertise when it was needed. Members of UWFRA provided training to the newly formed Bradford CRO team during the early part of 1962. The Bradford team was invited to accompany teams from UWFRA on practice rescues at New Goyden Pot and fell searches on Buckden Pike. This enabled members of the Bradford team, experienced cavers in their own right, to learn how to organise a rescue attempt and to handle equipment like Neil Robertson stretchers. This experience freely given, proved invaluable when the Leeds and Bradford CRO teams were called to assist at Mossdale in June 1967. The appalling tragedy at Mossdale Caverns in June that year was not the first time that the Upper Wharfedale Fell Rescue Association team had been called to an incident at the cave. On July 25th, 1953 two members of the newly formed Ilkley Pothole Club, Ted Ackroyd and Eric Woodrup entered Mossdale Caverns, the time was 10.00am. When they hadn’t returned to the surface by 22.00pm that evening their companion, who had remained on the surface raised the alarm and the Upper Wharfedale Fell Rescue team were alerted and set out for the cave. The two men spent most of their time underground that day exploring the Far Western Passages of the system; on their return to the entrance, upon reaching the main stream passage, they noticed that the water level has risen considerably. With great difficulty, they managed to make their way to Assembly Hall, a large flat-roofed chamber quite near to the entrance. Once there, due to the volume and force of the water they made a decision to remain in Assembly Hall until the water level had dropped sufficiently to allow a safe exit. The two men had come well prepared and upon checking their resources found that between them they had: Two headlamps and batteries, one hand torch, seven-part candles, one waterproof tube of matches, six spare bulbs, one petrol lighter, four wet cigarettes and a piece of chalk. They decided to move as high in the chamber as possible to keep clear of the rising water. From this position they lit a candle and with this, they dried out the wicks of the remaining candles. After establishing what they thought was a more comfortable place to wait, the pair discussed the options available to them. They devised a plan to keep warm by frequent exercise and to explore that part of Assembly Hall above the main stream. heard the shouts of the rescue team. Through their shouts and flashing lights they guided the team to where they were at the top end of Assembly Hall. The team provided them with dry clothes; they were given a pot of tea and a bar of chocolate as sustenance. The two cavers left the cave at 0315 hours on the Sunday morning, seventeen and a half hours after entering it. Despite the successful outcome of this rescue, the team realised that if the rainy weather at the time of this incident had not improved, the outcome could have been very different. In the team’s effort to find a solution to the flood risk present at Mossdale Caverns, it was decided to approach the landowner to request permission to create a flood channel on the surface to divert water away from the entrance. This request was unfortunately refused by the landowner. It was seven years later when UWFRA were once again called out to Mossdale Caverns. On the 20th June 1960 a party from ULSA (University of Leeds Speleological Association) entered Mossdale Caverns, with the intention of completing a survey. Two of the party got separated and went missing; they were June Willbank and John Stevens. Their companions attempted to locate them but to no avail. They main party was already very weary after completing a hard day’s surveying and made a decision to send someone out of the cave to raise the alarm. The call was received by UWFRA at 0215hrs and by 0430hrs a large team was assembled at the cave entrance. Parties under the leadership of Don Robinson and Paul Reinsch began the underground search, with a telephone link being established through to Assembly Hall a twenty minute journey from the cave entrance. Early the following morning an additional party, including RAF personnel entered the cave to extend the search. An hour later, both the missing cavers were found safe and well in the Far Western Passages and by 0910hrs were back on the surface. The remainder of the UWFRA members had all left the cave by 1030hrs and returned to Grassington by midday. Having completed two successful rescues from Mossdale Caverns, the team must have felt confident in tackling any future incidents occurring in the cave. However seven years were to pass before the team were to face their greatest challenge in Mossdale Caverns.